When four-time Emmy award-winning journalist Kimberly Suiters looks back on her professional life, she'll be hard pressed to come up with one story that defines her. Throughout a career that has spanned television, radio and print, she has broken so many big stories that it's simply impossible to choose just one. As a reporter in South Carolina, she exposed secret city council development deals. In Oklahoma City, her investigation of a headmaster led to the closure of a school.1 She's also co-authored two books ("A Random Act" and "Twist of Faith") on two remarkable women whose courage in the face of adversity continues to inspire her. Here in the D.C. area, where she serves as consumer investigator and weekend anchor at WJLA-TV, Suiters feels she's done her most meaningful work. Always ready to sound a warning or expose injustice, she has used a combination of instinct, intellect and good, old-fashioned hard work to uncover important stories the public needs to know. And in many cases, she has been the first to draw attention to harmful or dangerous products or trends. In January 2018, she warned parents about the prevalence of "Juuling" among local students. A Juul is a type of e-cigarette that looks like a flash drive, making it easy for students to hide it or deny it. At the time Suiters produced her report, Juuling was becoming increasingly prevalent in area middle and high schools, with two-thirds of students polled at one local high school admitting to doing it and one-fifth revealing that they Juuled daily, sometimes even sneaking a puff or two in class. One Juul cartridge contains as much nicotine as a pack of cigarettes. "I have a teenage daughter in high school and she told me about it," Suiters says. "Kids were Juuling in school . . . it was insidious . . . and parents didn't even know what it was." When researching her report, Suiters came across one article about Juuling in schools from The Boston Globe. Recently, the Washington Post did a story on Juuling and featured a photo of Suiters on the front page of the Metro section. She had talked about Juuling and other topics when she emceed a town hall meeting about substance abuse in Arlington County. "I believe The Boston Globe was the first to report on it, but we were the first television outlet to put together a comprehensive report," she says. In April, the U.S. Food and Drug Administration issued a major crackdown on retailers who had been selling the vaping devices to people under 21. Another important story Suiters investigated concerned the tendency for women who had gotten a certain type of breast implant to develop lymphoma. In 2017, Suiters' former colleague Maureen Bunyan tipped her off about some research suggesting that women who had gotten implants were more likely to commit suicide. Suiters was interviewing a plastic surgeon for that story when he told her about the lymphoma link. And he said no one was reporting on it. Sure enough, he was right. Back at the office, Suiters could find only one report—from France's Agence Nationale de sécurité du Médicament (the French counterpart to the F.D.A. )—suggesting a link between a type of textured breast implant and lymphoma. After Suiters did her story, it was picked up by the Columbia Journalism Review, which called her reporting "a fine piece of consumer health journalism" that is needed more than ever in the current regulatory climate. After that, CNN did a story, then USA Today, then The New York Times. But, Suiters says proudly, she and her team at 7 On Your Side were the first. Soon, the U.S. F.D.A. would go on to more clearly establish the link between this type of implant and cancer. It's no surprise that Kimberly Suiters grew up to be a consumer advocacy journalist: Even as a kid, she had a strong sense of injustice and a desire to right what's wrong. A D.C.-area native, she attended Taylor and McKinley elementary schools in Arlington. When she was at Taylor, she remembers her dad giving her a book, "The Value of Fairness," which was about Nellie Bly, the first female investigative reporter. It sparked her interest at a very young age. And her mom also instilled in her a belief in the importance of fighting for justice for the disenfranchised. "She took me to protests for the Equal Rights Amendment and vigils outside the White House when I was a little Arlington kid," Suiters recalls. Growing up, she remembers watching Lea Thompson, NBC's chief consumer correspondent, on "Dateline." Years later, she would start her investigative career as Thompson's chief intern, and would go on to work undercover for Thompson for two years at "Dateline NBC," where she helped expose a travel scam. At WJLA-TV, Suiters loves doing stories that make a difference in people's lives. She credits the station's collaborative team for helping multiply the impact of her reporting. "We'll do a story here on T.V. and it'll get some attention, but then we'll put it online and share it with our sister stations across the country," she says. "Before we know it, we'll have half a million people looking at our work." Since 2011, Suiters has been very happy to be part of the WJLA family. "We have some phenomenal professionals here at Channel 7," she says. "Newsrooms can be dog eat dog, but not this one. When we say '7 On Your Side,' we could be talking about the values of this organization internally, too. Everyone is very supportive." Despite having a career that has required her to move a few times for work, Suiters has spent most of her life in the D.C. area. Her mother has lived in Arlington since 1974 and is very active in her community, so Suiters definitely considers the D.C. area home. These days, she lives in Rosslyn, where she enjoys the benefits of an urban lifestyle, such as walking to work, running and biking on nearby trails, and eating out at neighborhood restaurants. "It's so exciting to live in Rosslyn and see all that the Rosslyn BID has done to make it a soulful community," she says. "A lot of my other Channel 7 colleagues live here, too. We have BBQs and go out for happy hour. We don't have to go to Georgetown. We love it, but we can stay right here." Besides running and cycling, Suiters also loves paddling on the Potomac, skiing (when she can! ), and hiking and camping in Lewes, Rehoboth and the Shenandoah Valley. 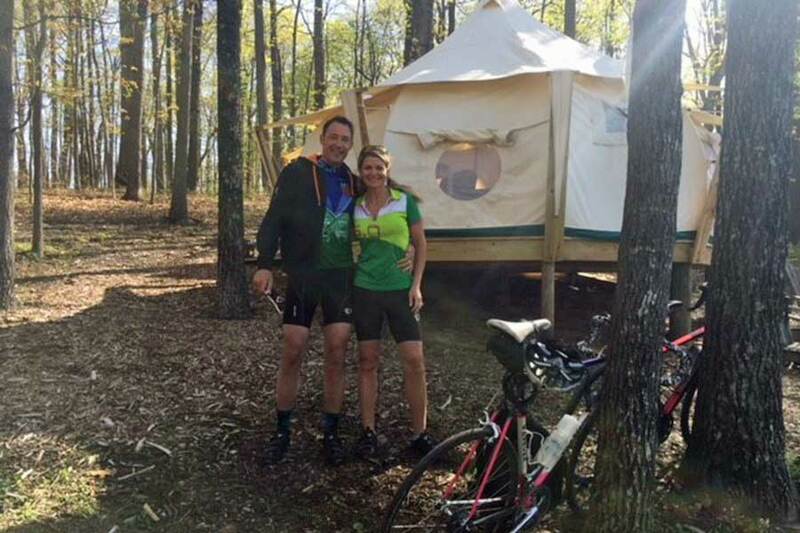 Her fiancé, Chris, who was her good friend when they attended Langley High School in McLean, is frequently by her side when she's embarking on these adventures. They are planning a July wedding. If you live or work here in the neighborhood, you might spot Suiters out and about in Rosslyn in the evenings or on the weekends. She's partial to the macchiato at Central Coffee, the Old Fashioneds at Barley Mac and the fish tacos at District Taco. And she says she's a huge fan of Hair Gallery at 18th and Oak, where she's had her hair done for years. "The women who work there are like sisters and they treat you like family," she says. "They don't really advertise . . . they're quietly there on Oak St., but they're a solid, special business. I love spending time with them." If you want to know more about Kimberly Suiters and the 7 On Your Side team, check out her bio on the WJLA-TV website, follow her on Twitter, or like her page on Facebook. And she's always open to your comments, suggestions and tips. Send them her way at ksuiters@sbgtv.com. 1. These details come from Kimberly Suiters' bio on the WJLA-TV website. Photo at top: Kimberly Suiters of the WJLA-TV 7 On Your Side team; Kimberly and Rosslyn BID President Mary-Claire Burick in the newsroom; Kimberly with her fiancé, Chris, on a recent 100-mile bike ride on the W&OD Trail from Rosslyn to Purcellville.